GLFW: http://www.glfw.org/download.html (File: glfw-3.0.1.bin.WIN32.zip, regardless whether using Windows 64 bits or not). GLEW: http://sourceforge.net/projects/glew/files/glew/1.9.0/ (File: glew-1.9.0-win32.zip, regardless whether using Windows 64 bits or not). Visual C++ Express 2010: https://www.microsoft.com/visualstudio/eng/downloads#d-2010-express (This application needs to be registered after 30 days. It’s free). 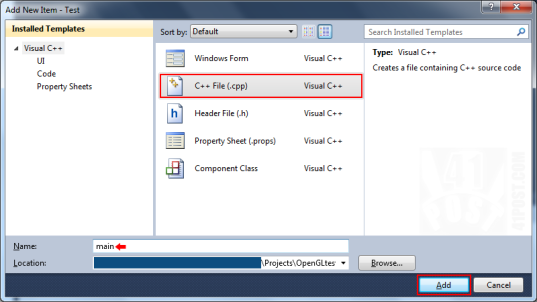 Now, install Visual C++ Express 2010. During installation, you will be prompted to install Microsoft SQL Server 2008 Express. This isn’t necessary for building OpenGL applications, so installing it is optional, in this case. 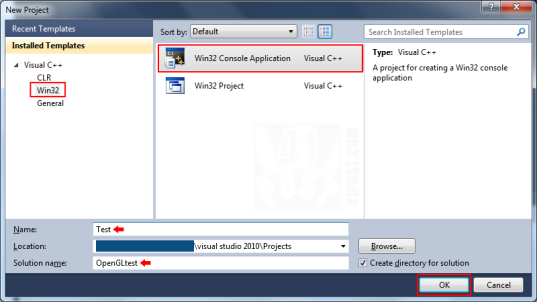 Just make sure that the .NET Framework (version 4.x) gets installed along with Visual C++ Express 2010. If your user has access to the root of the system drive (normally C:\), just create a folder there and name it opengl-wrappers or whatever other name you want to. Just keep the name short and avoid using characters such as spaces and capital letters. If you don’t have access to the root of the system drive, just create the opengl-wrappers folder elsewhere. Just make sure that it’s created at the shortest possible path. Notice that I’ve stripped the version identifier from both glfw and glew folders. This isn’t necessary. I did that to simplify the folder paths to be referenced later on the Visual Express project configuration (explained in detail at part 4). 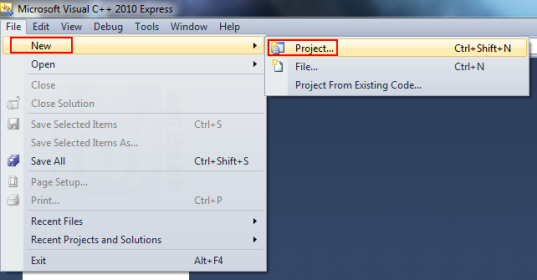 Now, launch Visual C++ Express 2010. If you are opening Visual C++ Express 2010 for the first time, you may have to wait for it to complete its initial configuration. After that, close any open solution that might be open (File → Close Solution), since we are going to create one from scratch. Select File → New → Project. Then, give the project and the solution a name. 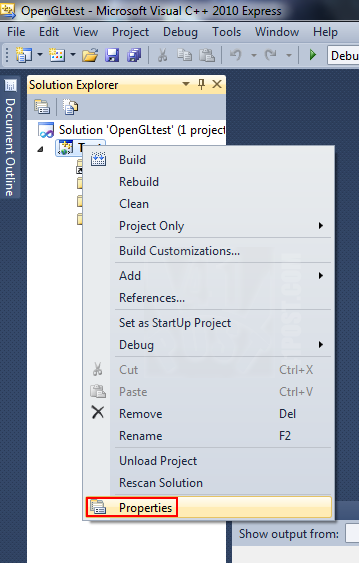 For this tutorial, the project will be named ‘Test’ and the solution, ‘OpenGLtest’. 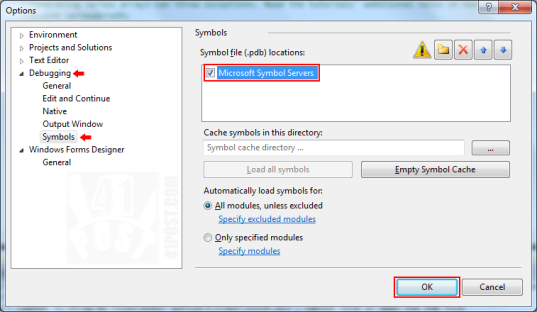 Leave the option Create directory for solution checked. Simply press the Next button. Choose Console Application as the ‘Application Type’. 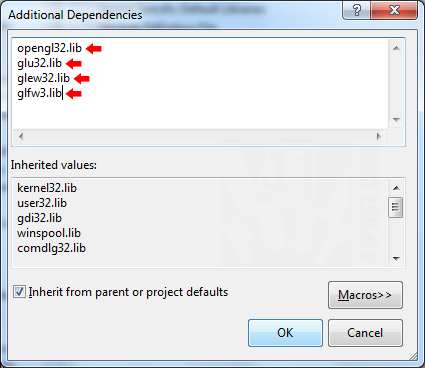 At ‘Application Options’ Deselect the Precompiled Header box and mark the Empty Project option. 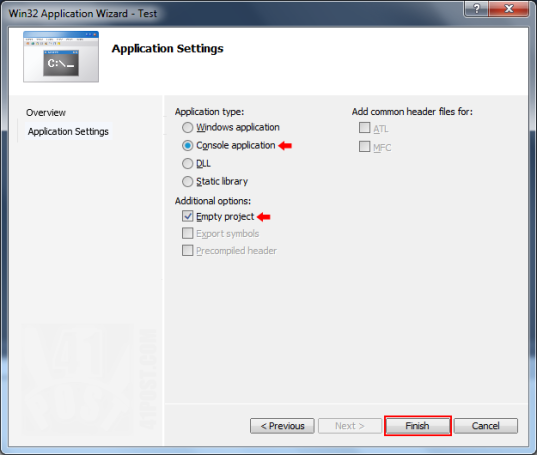 This part shows how to configure the project so that Visual C++ Express 2010 can find the GLFW and GLEW headers and libraries to link with when building the ‘Test.exe’ application. Name it main. Select .cpp as the file extension. Click on the Add button to confirm. Just leave the main.cpp file empty, for now. This will open the project’s properties, which is where the paths to the headers and library files for both GLEW and GLFW are configured. At the Configuration drop-down menu, select All Configurations. Also, make sure that the selected Platform is set to Win32. 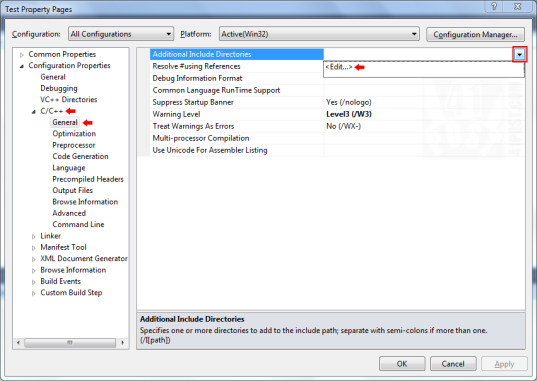 Select All Configurations and Win32 on the drop down selectors located at the top of the dialog. Select C/C++ → General → Additional Include Directories. Then click on <Edit…>. Click on the yellow folder icon and then on the button with the ellipsis to browse to the desired directory instead of manually typing the folder path. To confirm, just press the OK button. Select Linker → General → Additional Library Directories. Then click on <Edit…>. 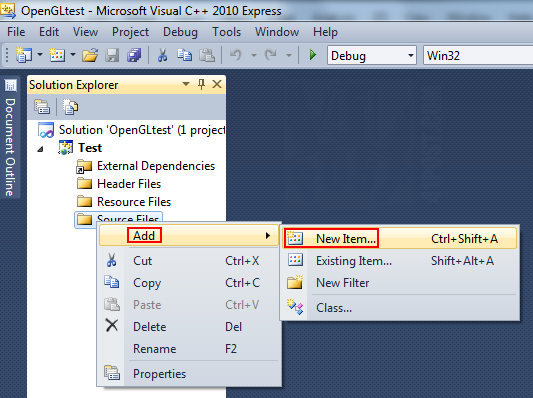 C:\opengl-wrappers\glfw\lib-msvc100 (or lib-mscv110 if you are using Visual Studio Express 2011). Again, click on the OK button. Select Linker → Input → Additional Dependencies. Then click on <Edit…>. Add the following libraries: opengl32.lib, glu32.lib, glew32.lib and glfw3.lib. 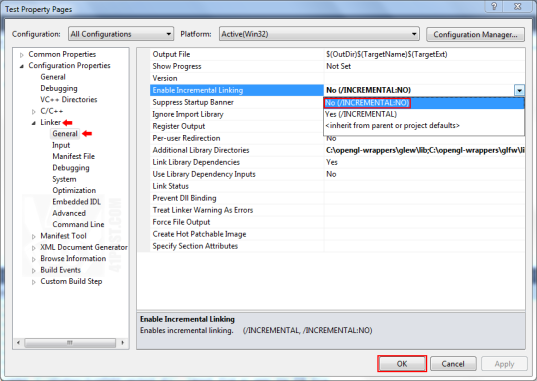 Select Apply and then OK to confirm and dismiss the project’s Property Pages dialog. Screenshot showing the glew32.dll file copied to the ‘Test’ project folder. 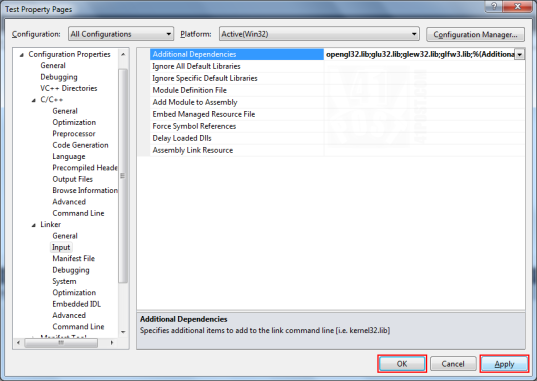 All Visual C++ Express 2010 configurations are now completed! Let’s try to build the project. //This function makes the context of the specified window current on the calling thread. After copying the code and waiting for a few seconds, if the include or the GLFW and GLEW function calls have a red underline beneath them, there’s a problem with the project configuration. Return to the fourth part of the tutorial. Case everything looks fine, continue reading this section. Right at the start of the above code, some headers are being included. The include order matters! To use GLEW with GLFW, the GLEW header must be included before the GLFW header. Then, after that, include any other library that may be required (lines 1 through 10). Moving on, two static functions that are later set as GLFW callbacks are defined: the error and keyboard callbacks. They are just like the ones found at the official GLFW documentation (lines 12 through 23). The first one prints any initialization errors to the console and the second one makes the application close if the escape key is pressed. Finally, the main() function is being defined. The first line of code inside it assigns the error callback (line 28), again just as stated on GLFW’s official documentation. Lines 31 through 34 simply initialize GLFW. If a problem takes place, the application exits. The next set of lines are purely optional, however it’s highly likely that you are going to be using them (lines 36 through 40). They set some request for specific features to the GLFW window. The first and second ones, if uncommented, will request a window to be created with a OpenGL context greater than 3.0 (3.1, 3.2 or 3.3, depending on the hardware) (lines 37 and 38). The last of this set of lines, if uncommented, simply request the correct OpenGL profile (line 40). Some problems might arise if setting this incorrectly. Read the Troubleshooting section of this tutorial. After all those verifications, it’s safe to try to create a window. This is done by declaring a GLFWwindow object at line 43 and at the following line, where a 640 by 480 pixels window with the title “Test Window” is created (line 46). With some luck, a GLFW window gets created. So, the next if statement on the code checks whether everything went as expected. In case something goes wrong while creating the window, GLFW terminates and closes the application (lines 49 through 53). Afterwards, the window is associated with the current OpenGL context (line 57). 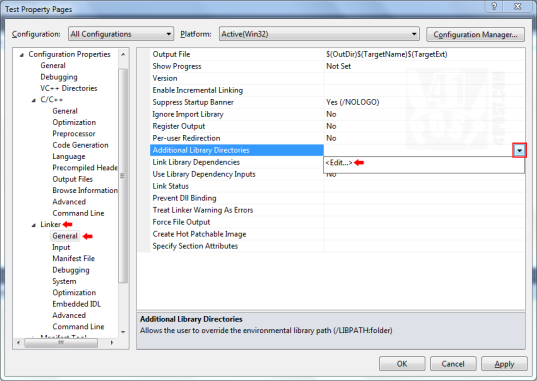 Please make sure that the glwfMakeContextCurrent() method call is made before initializing GLEW. Another GLFW function call assigns the key callback to be used (line 60). With that, GLEW is initialized and the following if statement just checks whether it was successful, closing the application if it wasn’t. This part of the code has been extracted from GLEW’s documentation (line 63 through 70). A blue color is set as the background’s clear color. Although it has nothing to do with GLFW or GLEW initialization, it’s an easy way to tell if everything has initialized correctly, including the association of the correct OpenGL context with the GLFW window (line 73). At the end of the main function declaration, a do-while loop is set to run indefinitely until the GLFW needs to close due to an error, or if the window is closed by the user (line 87). Inside the loop, the color buffer is cleared, the render buffers are swapped, making the window constantly render its contents, giving the illusion of animation (line 79 and 82). All rendering code should be placed at line 80, just before the glfwSwapBuffers() method call. The last bit of code inside the loop is a method call for GLFW to process its events, like inputs and window events (line 84). Outside the loop, at the bottom of the main() method declaration, the opened window is closed and GLFW is terminated (cleaned up) (lines 90 and 92). The main function returns zero (line 98). After successfully building the project, a blue window will open, like this one. 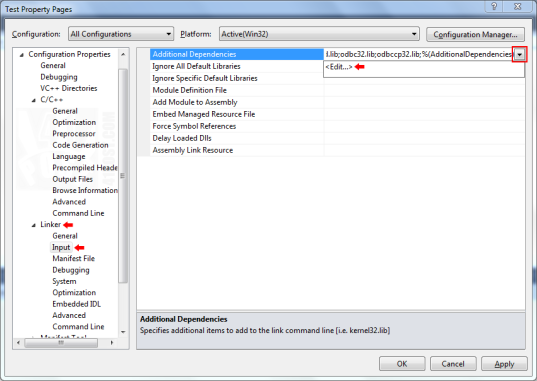 At the project’s properties, select Linker → General → Enable Incremental Linking. Set it to NO. 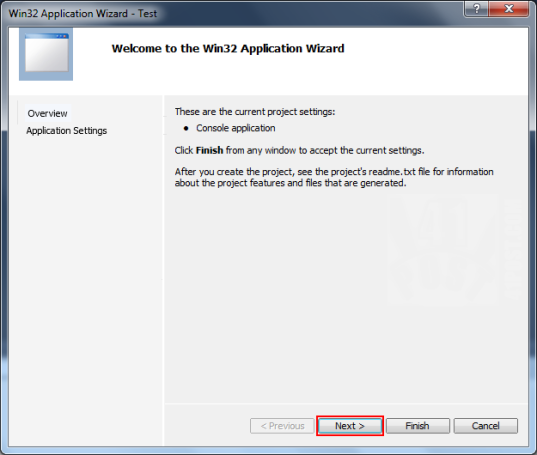 Simply enable that checkbox, click on OK and build the application (F7). You will be presented with a warning message that explains that the building process might take longer when this option is enabled. Press the OK button and OK once more, then rebuild the project (F7). Now, it will take much longer for the application to build, because Visual Studio C++ Express will download the missing PDB symbols. However, you don’t have to leave this option enabled as Visual Studio C++ Express will save the downloaded PDB files on disk, meaning that this option can be disabled after fetching the PDB symbols from the server and after successfully building the application at least once. Unhandled exception at 0x00000000 in Test.exe: 0xC0000005: Access violation. Created window closes right after its creation. This is probably happening because GLEW is being initialized ( glewInit() ) before assigning the created OpenGL context as the current one for the window. Therefore, you have to place the call to the glewInit() function after the calling glfwMakeContextCurrent(). Right after the application starts, an error message appears stating that glew32.dll isn’t present on the computer. Copy the glew32.dll file from C:\opengl-wrappers\glew\bin\ to the target folder where the application executable is being built. This tutorial has been tested on a Windows 7 64 bit machine with Intel HD 4000 integrated graphics GPU and on a Windows 8 64 bit machine with a NVIDIA GTX 260 GPU. It should work most recent Visual Studio versions. GLFW is being statically linked, at this tutorial. 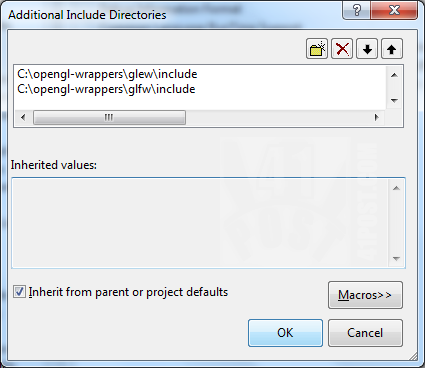 GLEW is being dynamically linked, meaning you have to copy its dll to the output folder. By the time this text is being written (Aug. 12th, 2013), there’s a newer GLEW version, which is number 1.10.0. The folder structure in this version differs from version 1.9.0 (featured in the tutorial). But with some small adaptations, this tutorial still works. Take a look at items #7 and #8. Download the package with precompiled libraries, not the one with the source code. The guidelines on this tutorial haven’t been tested for 64 bit applications. I’m not sure if the process shown on this tutorial can be applied for building 64 bit applications. If your user has the privileges to access the Program Files folder, after installing Visual C++ Express 2010 or any variation Visual Studio Express, please navigate to C:\Program Files (x86)\Microsoft SDKs\Windows\v7.0A\Lib (Windows 64 bits) or C:\Program Files\Microsoft SDKs\Windows\v7.0A\Lib (Windows 32 bits). Verify if the following files are at the aforementioned folder: OpenGL32.Lib and GLU32.Lib. 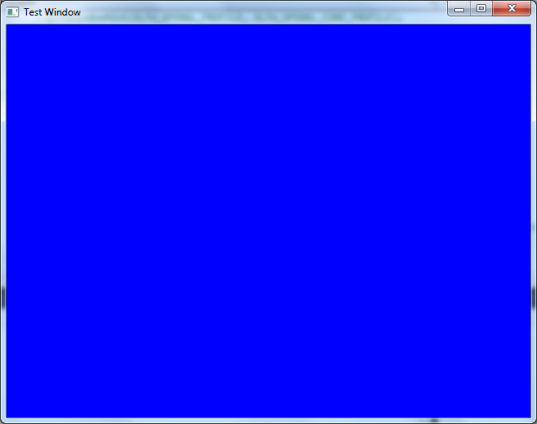 Creating a Windows Console Application isn’t a requirement in order to make an OpenGL application using GLEW and GLFW. This is being done so in this tutorial just because it’s convenient to have a dedicated window where errors are displayed, specially errors regarding window creation and OpenGL initialization errors. At the projection creation wizard, an Empty Project can also be selected. If you are using GLEW version 1.10.0 and up, the folder path should be replaced with something like C:\opengl-wrappers\glew\lib\Release\Win32. Since GLEW is being dynamically linked, you also need to copy the file glew32.dll to your Release directory and also bundle this DLL with the application (.exe file). If you are using GLEW version 1.10.0 and up, the glew32.dll file you will need to bundle with your application is located at: C:\opengl-wrappers\glew\bin\Release\Win32 . Please refer to the GLFW documentation to see how the numbers associated with the GLFW_CONTEXT_MAJOR and GLFW_CONTEXT_MINOR work. Also, see this link: http://www.opengl.org/registry/specs/ARB/glx_create_context.txt . This defines the size of the rendering area of the window, without taking into the account its borders and controls. On Windows 7, a 640×480 GLFW window is going to occupy approximately 656×518 px if all the borders and controls are taken in account. *The Visual C++ Express 2010, OpenGL, GLFW and GLEW logos are copyrighted to their respective owners. I have been looking everywhere for instructions this pedantic. What a life-saver. Getting OpenGL, GLEW and GLFW setup in Express 2010/2012 is exhausting. I didn’t realise I would be spending 3 days just to get a context up and running. These instructions are so complete. Can you post tutorial on modern OpenGL,bro ? That would be great ! After days and days loosing my hairs, your tuto show me the good way. there was some tweaks to do in visual studio 2015.